The Mayor of Manila (Filipino : Punong Lungsod ng Maynila) is the head of the executive branch of the Manila's government. The mayor holds office at Manila City Hall. Like all local government heads in the Philippines, the mayor is elected via popular vote, and may not be elected for a fourth consecutive term (although the former mayor may return to office after an interval of one term). In case of death, resignation or incapacity, the vice mayor becomes the mayor. The Manila City Hall is the official seat of government of the City of Manila, located in the historic center of Ermita, Manila. It is where the Mayor of Manila holds office and the chambers of the Manila City Council. It was originally intended to be a part of a national government center envisioned by Daniel Burnham in the 1930s. Although the dream plan was not fully implemented, some buildings for the proposed government center was constructed, including the Old Legislative Building, and the Agriculture and Finance Buildings. Miguel López de Legazpi, also known as El Adelantado and El Viejo, was a Spanish navigator and governor who established the first Spanish settlement in the East Indies when his expedition crossed the Pacific Ocean from the Viceroyalty of New Spain in modern-day Mexico, arrived in Cebu of the Philippine Islands, 1565. He was the first Governor-General of the Spanish East Indies which included the Philippines and other Pacific archipelagos, namely Guam and the Marianas Islands. After obtaining peace with various indigenous nations and kingdoms, he made Cebu the capital of the Spanish East Indies in 1565 and later transferred to Manila in 1571. The capital city of the province of Albay bears his name. Datu is a title which denotes the rulers of numerous indigenous peoples throughout the Philippine archipelago. The title is still used today, especially in Mindanao, Sulu and Palawan, but it was used much more extensively in early Philippine history, particularly in the regions of Central and Southern Luzon, the Visayas and Mindanao. The Legislative Districts of Manila are the representations of the city of Manila in the various national legislatures of the Philippines. The city is currently represented in the lower house of the Congress of the Philippines through its first, second, third, fourth, fifth, and sixth districts. Arsenio H. Lacson was a Filipino journalist and politician who gained widespread attention as Mayor of Manila from 1952 to 1962. An active executive likened by Time and The New York Times to New York's Fiorello La Guardia, he was the first Manila mayor to be reelected to three terms. Nicknamed "Arsenic" and described as "a good man with a bad mouth", Lacson's fiery temperament became a trademark of his political and broadcasting career. He died suddenly from a stroke amidst talk that he was planning to run in the 1965 presidential election. With Arsenio Lacson becoming the first elected Mayor, the City of Manila underwent The Golden Age,  was revitalized, and once again became the "Pearl of the Orient", a moniker it earned before the outbreak of the war[ citation needed ]. After Mayor Lacson's term in the fifties, the city was led by Mayor Antonio Villegas during most of the 60's, and Mayor Ramon Bagatsing for nearly the entire decade of the 70's until the 1986 Edsa revolution. Antonio de Jesus Villegas was a Filipino Mayor of Manila from 1962 to 1971. His term was after the term of Arsenio Lacson as Mayor of Manila, and before the period of martial law in the Philippines. Ramón Delaraga Bagatsing was the longest-serving Mayor of Manila. He is the only Indian Filipino and person with disability to serve as Mayor of the City of Manila from 1971 to 1986. Bagatsing also holds the unique distinction of being the only person to survive both the Bataan Death March and the military hero for the Liberation of Manila during the Second World War and the Plaza Miranda bombing in 1971. The People Power Revolution was a series of popular demonstrations in the Philippines, mostly in the capital city of Manila from February 22–25, 1986. There was a sustained campaign of civil resistance against regime violence and alleged electoral fraud. The nonviolent revolution led to the departure of dictator Ferdinand Marcos, the end of his 21-year presidential rule, and the restoration of democracy in the Philippines. Gemiliano "Mel" Campos López, Jr. was a Filipino politician who served as the Mayor of Manila from 1986 to 1987 and 1988 to 1992 and an assemblyman of the Batasang Pambansa of the Philippines from 1984 to 1986. He was also a former chairman of the Philippine Sports Commission. The office of the mayor is often used as a springboard for further political ambitions. In 1961, Lacson bolted the Nacionalista Party to become the campaign manager of the Liberal Party's Diosdado Macapagal's presidential campaign. After Macapagal's victory, Lacson returned with the Nacionalistas and became a critic of the Macapagal administration. Lacson would've been likely the Nacionalista's candidate for the presidency in 1965, had not death intervened in 1962. In 1998, the sitting mayor of Manila, Alfredo Lim, did run as the Liberal Party's candidate for the presidency, but was beaten by Joseph Estrada, finishing fifth in a field of ten candidates, garnering 9% of the vote. Elections are administered by an independent Commission on Elections every three years starting 1992. Held every second Monday of May, the winners in the elections take office on the following June 30. The People's Reform Party is a centre-left political party in the Philippines. Founded on April 12, 1991 as the political party of former Agrarian Reform Secretary Miriam Defensor Santiago for her bid as President in the 1992 Presidential Elections. During the 1992 Elections, the party nominated Santiago as President and Ramon Magsaysay, Jr. as Vice President, however both Santiago and Magsaysay lost the elections to former Defense Secretary Fidel Ramos and tehen-Senator Joseph Estrada, respectively. While under the same Miriam Defensor Santiago wing, the Youth Reform Movement Philippines is not related to PRP. The Vice President of the Philippines is the second-highest executive official of the government of the Philippines, after the President. The Vice President currently holds office at the Quezon City Reception House in Quezon City. Previously, the Vice President of the Philippines held office at the Coconut Palace, the Philippine National Bank Financial Center, and the Philippine International Convention Center, all in Pasay, Metro Manila. Ronaldo Villanueva Puno, also known as Ronnie Puno, is a campaign manager and strategist in Philippine politics. He supported the presidential bids of eventual winners Fidel V. Ramos, Joseph Estrada, and Gloria Macapagal-Arroyo. Puno is also responsible in the campaign of Vice President and UNA presidential candidate Jejomar Binay for the 2016 elections. José Livioko Atienza Jr., commonly known by his nickname Lito Atienza, is a Filipino politician. He is the former city mayor of Manila and former secretary of the Department of Environment and Resources. He stepped down as mayor of Manila on June 30, 2007, after serving a three-year three-term limit for local government executives set by the Philippine Constitution of 1987. He currently hosts GMA Network's Maynila since 1998. This is a complete list of Philippine Presidential elections since 1935 with the candidates' political party and its corresponding percentage. Local elections was held in Manila on May 13, 2013 within the Philippine general election. The voters elected for the elective local posts in the city: the mayor, vice mayor, the six congressmen, and the councilors, six in each of the city's six legislative districts. Manila held its local elections on Monday, May 9, 2016, as a part of the 2016 Philippine general election. Voters elected candidates for Mayor, Vice Mayor, 6 Congressmen, and the 36 councilors that will be members of the City Council. 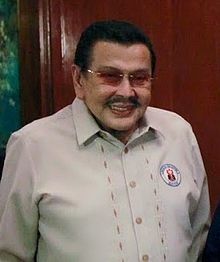 Incumbent Mayor and reelectionist Joseph Estrada won the elections, securing him to serve his second 3-year term as the Mayor of Manila. He won by a slim margin at only more than 2,000 votes against his closest rival, former Manila Mayor Alfredo Lim. Dr. Maria Shielah “Honey” Lacuna-Pangan, daughter of former Manila Vice Mayor Danny Lacuna, Estrada’s running-mate, topped the vice mayoral race with 268,969 votes.